Dynamite is thrilled to announce a new comic book series featuring the hottest band in the land, KISS! Writer Bryan Edward Hill (Detective Comics, Postal) and artist Rodney Buchemi (Death of Hawkman) crank the volume high as they bring you the KISS series we have all been waiting for this October! In KISS: Blood and Stardust, an immortal cabal is taking the lives of innocents and the only ones who can stop them are KISS! The only problem…they are dead. And now they have to make a deal with a demon to save their souls and return to Earth to fight evil! "KISS was the soundtrack of a time in my life where I had tons of ambition and few rules. Endless nights in dive bars in New York City, watching sunrises on the rooftops of Brooklyn. I might have discovered them in the aughts, but I was filled with the spirit of the 70's,” remarked author Bryan Hill. “The 1970's was a special decade, a decade of fame and magic where guitar riffs and drum solos were your co-pilots and the devil MAY have cared, but he couldn't stop your shine. The origins of KISS comic books date almost as far back as the inception as the band itself, having been an integral part of comics culture since their 1977 appearance in Howard the Duck #12 and 1978's Marvel Comics Super Special: KISS. Today, nearly 40 years later, Dynamite Entertainment is the proud home to the comic book series KISS, KISS: The Demon, KISS/Vampirella, KISS/Army of Darkness and now KISS: Blood & Stardust. “Fans can expect to relive that magic, terror, and power in these pages. They should prepare to see the mystical occult power that weaved itself into pop culture, characters in league with it, celebrity-filled with it, and a story of the innocent lives caught in the balance. I've always wanted to tell a story about a band that saved the world. Now I have my chance," added Hill. The debut issue of KISS: Blood & Stardust features a wide selection of cover variants, providing fans and retailers a chance to collect the whole set! The cover artwork features the talents of Stuart Sayger (The Walking Dead), Rodney Buchemi (Legenderry Red Sonja), Maria Sanapo (DC Bombshells), and a classic KISS photo cover, respectively. Two Atlas Editions will also be available for fans wishing to have their issue signed by writer Bryan Hill or signed by rock legend Gene Simmons! As America's #1 Gold Record Award-winning group of all time (in every category), KISS is easily one of rock's most iconic and influential bands. The Rock N Roll Hall of Famers have released 44 albums and sold more than 100 million albums worldwide. 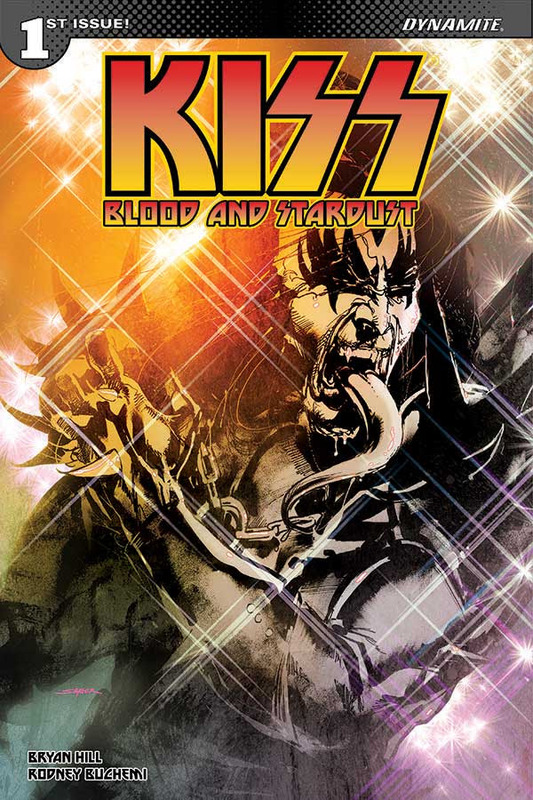 KISS: Blood and Stardust #1 will be solicited in Diamond Comic Distributors' August 2018 Previews catalog, the premier source of merchandise for the comic book specialty market, and slated for release in October 2018. Comic book fans are encouraged to reserve copies of KISS: Blood and Stardust #1 with their local comic book retailers. KISS: Blood and Stardust #1 will also be available for individual customer purchase through digital platforms courtesy of Comixology, Kindle, iBooks, Google Play, Dynamite Digital, iVerse, Madefire, and Dark Horse Digital.